Meditation means many different things to many different people. There are several approaches to meditation, several layers of consciousness to explore and different levels of difficulty. There are those who follow an accepted course of some kind, like Kabbalistic meditation or Transcendental meditation. And there are those who are more drawn to moving forms of meditation, such as Yoga or Tai Chi. Most are just looking for more inner peace and a connection with the natural world in which we live. What is common to many forms of meditation is the component of sitting and maintaining a relaxed pose in a place of silence. This, of course, is an oversimplification, but it is not as simple as it may sound. The difficulties that people tell me of, and that I myself am no stranger to, are the very reason that meditation can be so life-changing for us. The realization that staying mindful of our walking, or maintaining mental silence for a few minutes, is so difficult, when we humans are supposed to be the masters of our physical world, is one that leads many people to realize their own potential for growth. This is why acheiving the simple acts of maintaining silence of the mind and awareness of our reality, empowers us and shows us our connection all other life. Gaining this place of silent connection is the true meaning of meditation, no matter what form that meditation takes. Ah. That is the question! The approach is a very easy one. The mastery is not always so. To begin with, you need to find a comfortable position that you can rest in. Most people use a cross-legged position. Lying down, though comfortable, is not the best position for learning meditation. Lying down signals sleep to your mind, and if you try to relax the mind in this position, you will inevitably end up asleep. I always suggest that beginning meditators sit on the floor, this helps to ground you and also to release any fears that you may relax too much and fall off of your chair. So, you are most likely to begin by sitting cross-legged on the floor (or on a nice cushion, on the floor.) I always begin this way, with my back straight, supported by a wall. The intention here is to relax your muscles, rest your eyes and release all worry from your mind. There may be an overall intention to astral project, meet your spirit guide or gain psychic abilities, but that is not the point of each individual meditation. Release these desires, be the beginner, be the student. Doing meditation is called “practicing” just as in Yoga or in doing magic. That is because we are always the student, these are abilities that have no end, that continually grow and evolve, presenting new challenges along the way. We are always learning. So now you sit in quiet contemplation, keeping your mind empty (or focused on your own inner body perceptions and mental perceptions) for as long as you can. 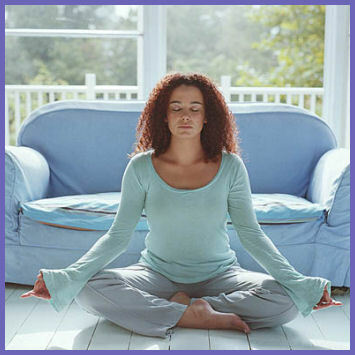 A fifteen or twenty minute meditation can change the entire energy and outcome of your day. But in the beginning, allow yourself to practice for only three, four or five minutes. Do not worry if you cannot stay still or carefree for longer than that. Once you become comfortable with the general concept and practice of meditation you can feel free to try adding instructive aids of some kind. These may be counting techniques or similar approaches learned from a book. They may be sentences or affirmations that you say to yourself repeatedly throughout your meditation. You may also find guided meditations, either audio or video, quite helpful. I myself learned meditation, guided by a friend, using the simple tree meditation, which I eventually memorized and I still use variations of it regularly. But I can’t meditate, I am so frustrated by my failed attempts. I thought this was supposed to be relaxing! It is indeed meant to be a relaxing and comforting activity. If it isn’t, then it is probably one of three things… let’s look at the three most the common roadblocks to successful meditation. I can’t sit still: You are most likely a person with high levels of energy (ie. anxiety) and teaching your brain that it is okay to relax and not be always doing is something that will take time. Begin by setting a stop watch and observe how long you can sit still for. Then slowly increase it in ten-second intervals. Force your body to just BE. Eventually you will not need the stop-watch or the forced increases anymore. Go slow and you will get there. My mind will not stop thinking: This is the most common reason that people decide they are unable to meditate and give up trying. They can only seem to keep their head clear for 30 seconds or so, but the minute that they begin to relax into a meditative state, another thought pops into their mind. When this happens ten or more times, each and every time that they attempt meditation, it is not surprising that they become frustrated. I was this person! I swore to my meditation teacher that I would NEVER be able to meditate, and I was truly convinced of that fact. But it wasn’t a real truth for me. And it isn’t for you either. Perhaps, you are dragged out of your meditation by every creaking floorboard, passing ambulance siren or barking dog. I was too. But I promise you that this is just a stage. Your conscious mind, the ego, does not want to release control and will amplify every thought, worry, sound and itch to try and maintain that state of control. But it does eventually loosen its grip, if you stick with it. You will not fail, unless you give up and stop trying. I don’t think that I am doing this right. I don’t feel anything: You have probably come to meditation with some unrealistic expectations of what you would experience. There is no wrong way to meditate. The intention with meditation is to build a stronger, more open connection with your true inner self. There are as many methods for achieving that connection as there are individual people. If you feel like this time is your own, than that is enough. What matters is that you take the time to stop, be at peace and listen to yourself. If you are giving time to practicing meditation, you are already doing it right. Well, as you can see, meditation is not just about the health benefits. The process of learning to meditate also involves developing patience and perseverance, two skills which we as modern humans tend to have less and less of. This benefit alone is worth the early struggles. But you are also making time for yourself. Taking a few minutes to spend with yourself everyday (even if you never meet Elvis on the astral planes) has been shown to lower your blood pressure, relieve anxiety, heal depression and cure insomnia. And these are just some of the benefits that meditation can have for you. If it benefits each individual practitioner in such meaningful ways, imagine what your own self-improvement can do for your friends, family, colleagues and the planet as a whole!